Andis® Ultra Edge 2-Speed Clippers offer a SUPER high speed of 4,400 strokes per minute, so your finished work will be dramatically smoother. These Andis Horse Grooming Clippers include a FREE 4 oz bottle of blade oil, and an extra blade drive. Feature an extra long 16’ cord. 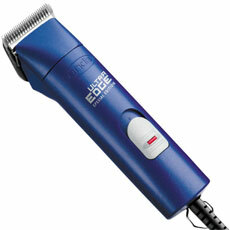 Use Andis, Master Grooming Tools™, Oster® and Wahl® detachable-style blades. Clippers come with a #10 blade.